We can handle frames/iframes present in the webpage using driver.switch_to command in selenium webdriver. Frame/iFrame is nothing but another webelement in html page, which displays another part of webpage. If you take a look at the DOM structure of a page that contains an iframe you will never find inner content of the iframe. And you won't be able to interact with it via the DOM. We have to switch into frame to see the elements present in the frame. Both Frame and iFrame are treated similar manner with Selenium webdriver, Selenium doesnot differentiate them, so e can handle both of them in same way. Frame is a HTML tag and used to divide the same web page or same domain into various frames/windows. Used as <frame> tag, it specifies each frame within a frameset tag. Frames are used along with frameset, frameset contains the multiple frames. 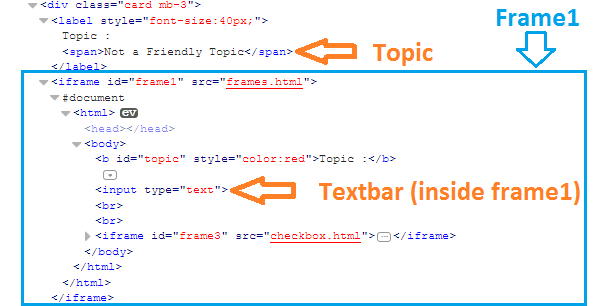 Iframe as <iframe> is also a tag used in HTML but it specifies an inline frame which means it is used to embed not only same domain but also other webpages within the current HTML document. It is like a Television, it displays a thing which is present somewhere else. Frame requires a frameset, but iframes donot requires framesets. Adjusting the size and width of the Frame is difficult when compared with iFrame. Frames cannot contains nested frames (frame inside frame) but iFrames can contain nested iFrames. HTML5 doesnot support Frames, but supports iFrames. Developers try to avoid using Iframes as these are external documents (webpages), so there is chance of Phishing. It is important for tester to check whether an element is inside a iframe/frame or just on webpage. If element is inside a frame then we have to switch into frame to access the element. 1. Right click on the page (not on the element) which part you want to check . 2. On the right click options you can find This Frame Option, if this option is present then there is a iframe else there is no iframe 3. Webpage without frame. We can find the iframe/frame using right click in manual testing, finding the iframe/frame in selenium is little tricky one. Using ID and Name are looks similar in syntax as these two are overloaded methods, find the examples below. Using Element : Most of the time there will be multiple iframe/frame and few of them may share same id and name, so in such scenarios we cannot use id or name for finding the frame. So find the iframe/frame uniquely we have to find it as a element, the way we follow for normal elements. Here we can use locators ( except id, name, as we used already) like classname, xpath css. We cannot use link text and partial link text as these two are only applicable for anchor tag <a>. We also should refrain using tagname locator as there are multiple frame so we may not get the unique element. If we want to access any element inside a iframe in selenium webdriver, we must find and switch to that iframe and access the element. 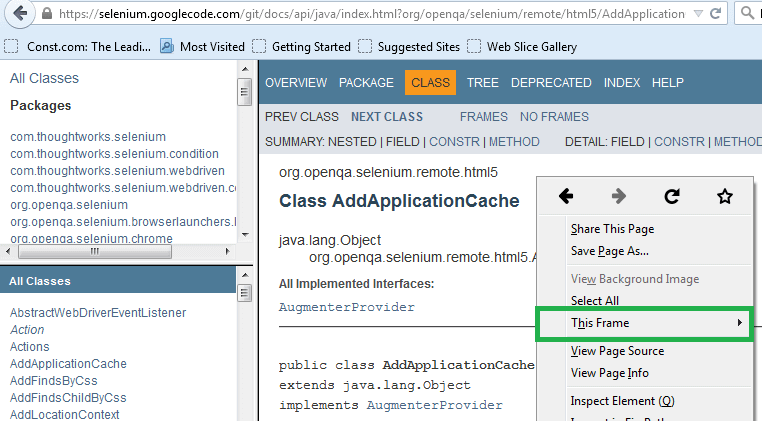 Selenium webdriver throws NoSuchElementFound Exception unless we switch to the iframe. 2. Get the text from the Topic element and store it in a string. 3. Switch to the Frame1, frame have attribute id='frame1' and which is unique so we can use id way switching to the frame. 4. Find the Text bar in the frame1 and enter the stored text. Sometimes we will have multiple and nested iframes in a webpage, if we have nested iframes we have to switch to iframe inside frame. We can access only content of frame when we are inside a frame, we cannot access outside the frame or inside any other frame. 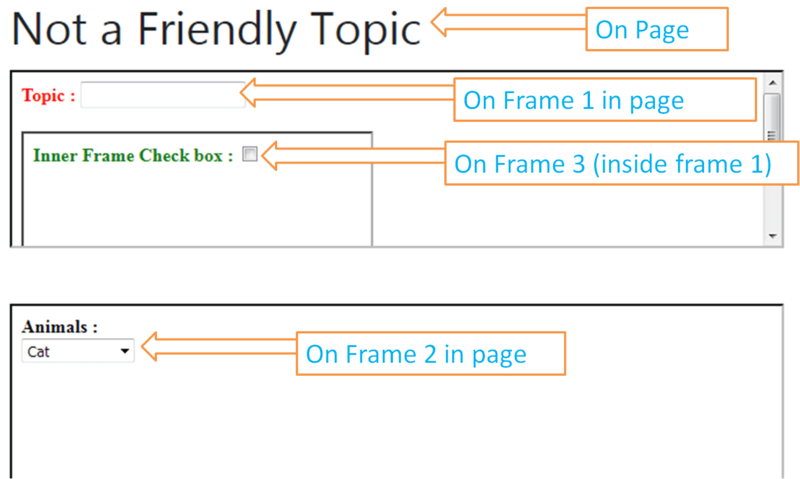 Scenario : Check the check box present in the iframe 3 , iframe 3 is present inside iframe 1. 1. Find the iframe1 and store it as webelement. 3. Find the iframe 3 and swicth to it. 4. Find the Check box and click it if it is not already checked. Complete programe to handle nested text bar. Switch to Parent Frame : switch_to.parent_frame() method in selenium switches the control to outer position(one place) in web page, the outer position could be a frame or page level. In simple terms, parentFrame() method exits the current frame. After performing a particular task we have move out of the frame, otherwise we cannot access the elements outside the frame. 3. 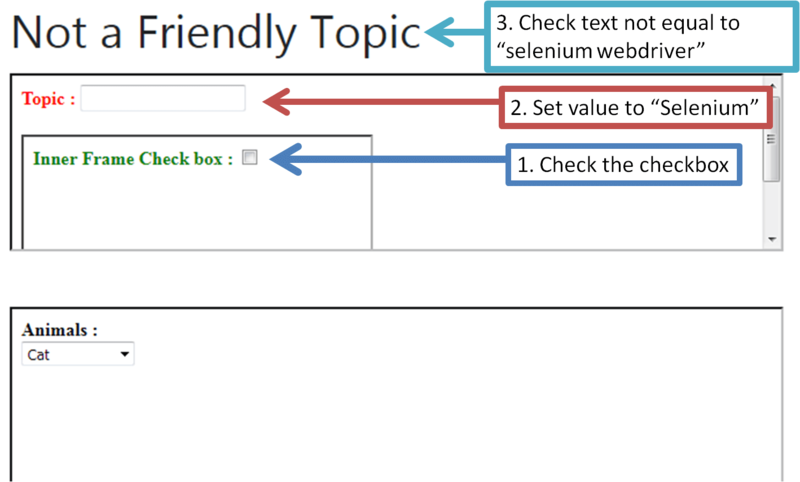 Now move back to page level and compare the topic(header) text is not equal to "selenium webdriver"
Solution to Scenario : skipping few steps which were covered in previous scenario. 3. Find the textbar and enter the "selenium" text" in it. 5. 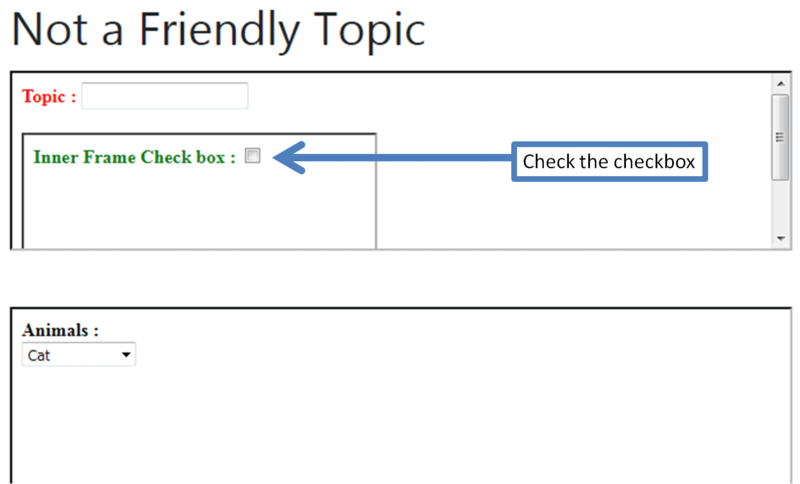 Find the topic header element and fetch the text. 6. Compare the topic text with expected value "selenium webdriver"
Default Content : switch_to_default_content() method exits all the iframes and the places the selenium control at the page level where as parentFrame() method exits the current iframe. 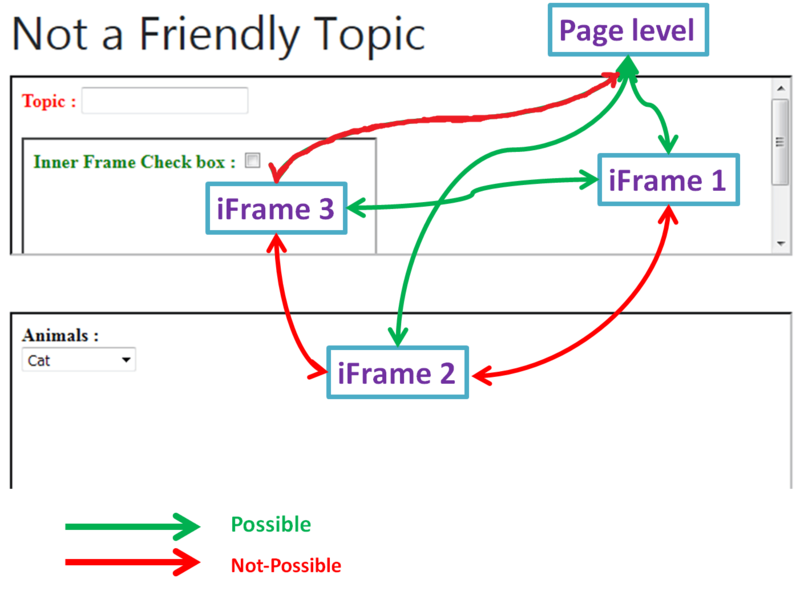 Once we reach page level we cannot access any elements inside the iframe unless we switch to it. 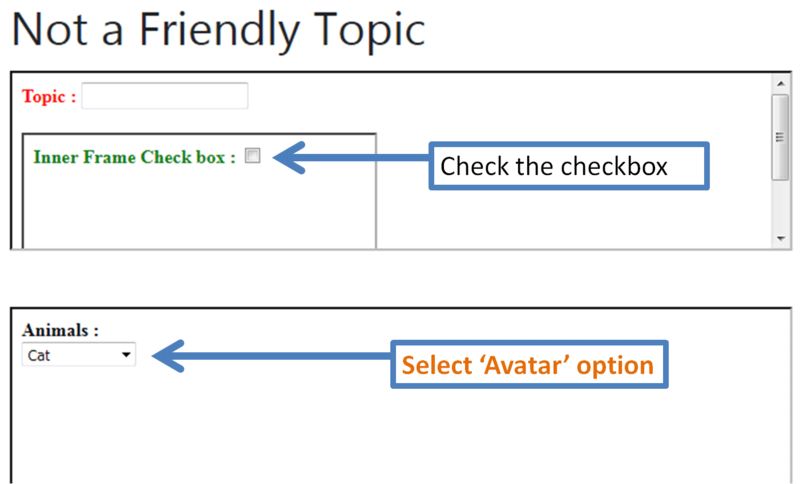 Scenario : Check the check box(frame 3), and select the 'Avatar' option from the Animals dropdown(frame 2). 5. Find the Animals dropdown and store it in type variable. 6. Create object for select class, and call select_by_visible_text() method from the Select Class object. Below images expains the possible routes of the iFrame navigation.